In the past five trading days, telecom stocks started trading on a positive note but eventually witnessed a steady decline as the lira crisis in Turkey rattled the global market. However, the stocks gained some lost ground by the end of the week as China decided to initiate low level trade talks with the United States in late August to set the ball rolling for further such negotiations between the two countries involved in a trade war. As President Trump decided to double the tariff on its long-time NATO ally, raising the levies on Turkish steel and aluminum from 20% to 50%, the lira went for a free fall and depreciated against major currencies, including the U.S. dollar. This had a rippling effect across global equity markets as investors began to worry about surging Turkish debt levels and its ability to repay. In a retaliatory move, Turkey’s President called for the boycott of all U.S. electronic products and gadgets, which could hit the telecom stocks in future if the friction continues to escalate. Amid such a discord, China announced that it will send Vice Commerce Minister Wang Shouwen to the United States in late August to initiate trade talks at the lower rungs — the first official exchange in two months — that showed signs of possible patch-up of the trade hostilities between the nations. The strategic move could be a result of the continued decline in China’s equity markets and a losing streak for the yuan. Although it is too early to predict any favorable outcome for the trade impasse, it surely is encouraging news for the overall technology industry in general and telecom sector in particular. Regarding company-specific news, quarterly earnings, dividend increase and lawsuit settlements took the center stage over the last five trading days. 1. CenturyLink, Inc. CTL reported mixed second-quarter 2018 results wherein the top line missed the Zacks Consensus Estimate but the bottom line surpassed the same. 2. Windstream Holdings, Inc. WIN reported lackluster second-quarter 2018 results with lower revenues and wider losses on a year-over-year basis. 3. QUALCOMM Incorporated QCOM announced that it has reached a settlement with the Taiwan Fair Trade Commission in an anti-trust case for about $93 million to safeguard its patent-licensing business. 4. Badger Meter, Inc. BMI announced a 15.4% year-over-year hike in its quarterly dividend payout. The proposed dividend of 15 cents per share or 60 cents on an annualized basis is payable Sep 14, 2018 to shareholders of record as on Aug 31. 5. Viasat Inc. VSAT reported better-than-expected results in the first quarter of fiscal 2019. In the past five trading days, Verizon Communications Inc. VZ was the major gainer with the share price increasing 1%. SBA Communications Corporation SBAC was the major decliner with its stock losing 1.4%. Over the past six months, Motorola Solutions, Inc. MSI was the best performer with its stock appreciating 11.9% while AT&T Inc. T declined the most with its shares falling 14.4%. 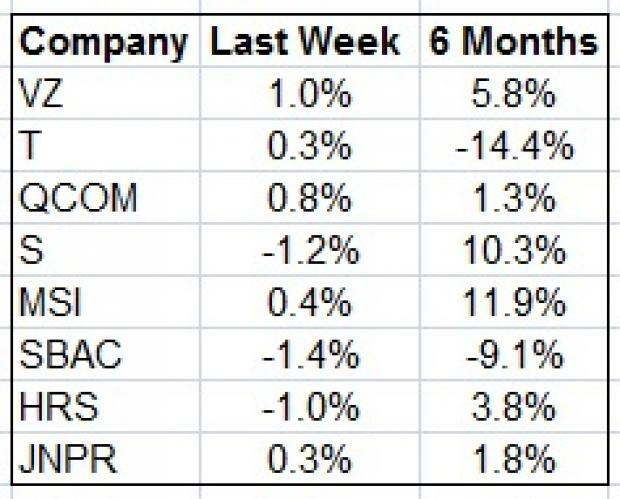 Over the past six months, the Zacks Telecommunications Services industry has recorded an average fall of 4.9% while the benchmark S&P 500 Index has gained 4.2%. In addition to continued product launches and deployment of 5G technologies, all eyes will remain glued to how the telecom sector braces itself for the impact of the trade war.